Interest in science at the papal court embraced not only mathematics and astronomy but also the more obviously practical fields of medicine and natural history. In these areas too the Vatican Library developed rich holdings, which extend from the classic general works of Plato and the challenging poem of Lucretius to standard medieval textbooks. The city became a lively center of research and publication. 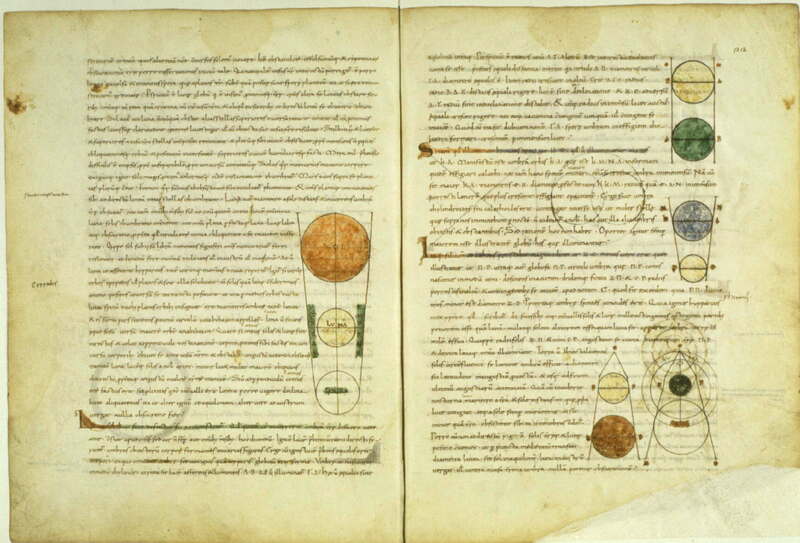 In the fifteenth century scholars in the curia translated the complex and important biological works of Aristotle, and presented splendid manuscripts of their finished products to their patrons. They thus dramatised the fact that the greatest Greek philosopher had also been a great empirical scientist, who waded out into the ocean to catch interesting fish and dissected starfish in order to try to understand how their organs functioned. In the sixteenth century, Roman scholars edited and translated the oldest corpus of Greek medical texts, the works ascribed to Hippocrates. These were full of fascinating case studies and suggestive remarks about scientific method. Roman doctors adopted the new anatomical methods of the day, based on systematic dissection of the muscles and bones. They held dramatic public demonstrations of their skill, and sometimes found that they could criticize the work of the most influential anatomist of the time, Andreas Vesalius. Copies of works on natural philosophy by standard authorities of the Middle Ages and early Renaissance reached the papal library from many sources. Calcidius's version of Plato's cosmology, produced in the fifth century A.D., was an influential source for medieval ideas about the natural world. In the late sixteenth century, this manuscript belonged to Leiden University professor Daniel Heinsius who gave it to his son Nicholas. Nicholas, whose signature appears on the manuscript, was the librarian of Queen Christina of Sweden, whose collection came to the Vatican Library after her death. 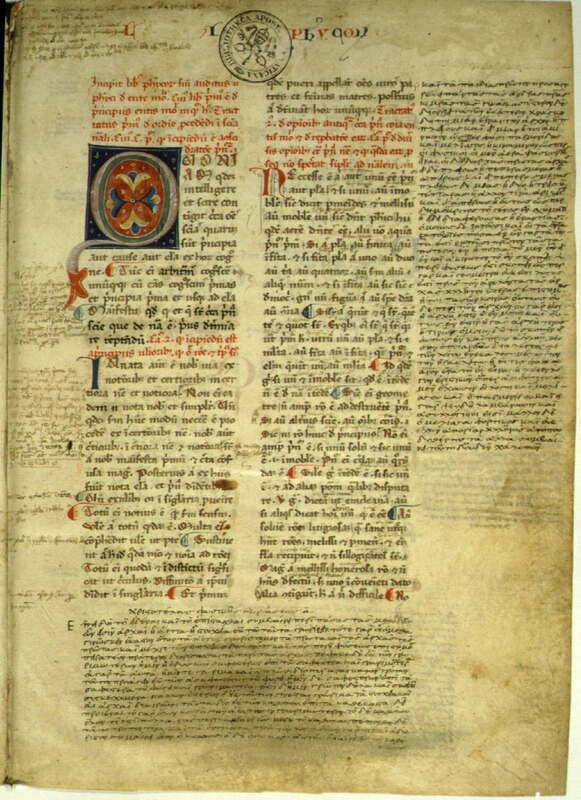 This copy of Aristotelian philosophical and scientific texts, regularly studied in Latin translation in medieval and Renaissance universities, once belonged to the Florentine humanist Giannozzo Manetti (1396-1459), friend and biographer of Pope Nicholas V. Manetti applied humanist Greek scholarship to the study of Aristotle. He copied part of the Greek text of the "Physics" in the margins of the Latin translation. After his death, Manetti's numerous books became part of the Palatine Library at Heidelberg. They entered into the papal collections when the Heidelberg library was carried off to Rome in the course of the Thirty Years War. 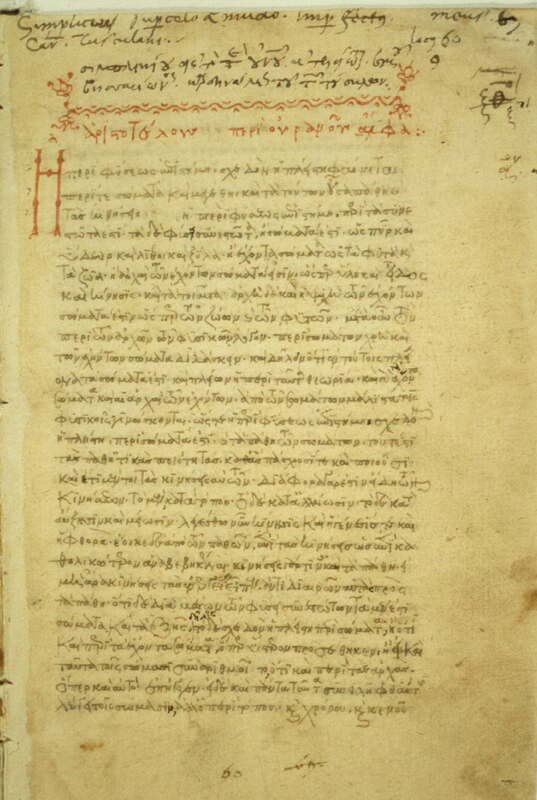 Simplicius, Commentary on Aristotle's "De caelo"
The early Greek commentators on Aristotle's accounts of the natural world, of whom Simplicius (sixth century A.D.) was one of the most influential, offered challenging accounts of and objections to his theories. Their study expanded in fifteenth- century Italy. This manuscript is signed by a former owner, Cardinal Bessarion, whose household in Rome was an important center of Greek studies. 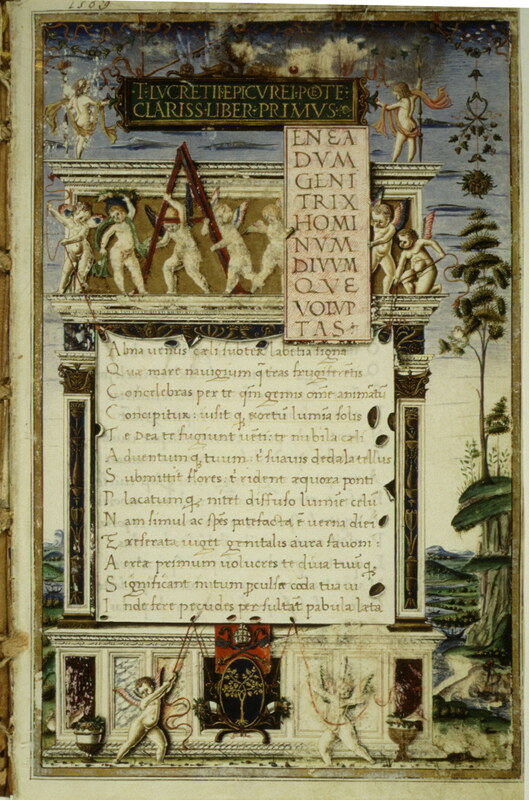 This elegant manuscript of Lucretius's philosophical poem, copied by an Augustinian friar for a pope, is an example of the interest in ancient accounts of nature taken by the Renaissance curia. The work, written in the first century B.C., contains one of the principal accounts of ancient atomism. The poem was little known in the Middle Ages and its author dismissed as an atheist and lunatic, but after the discovery of an early manuscript in 1417 by the humanist and papal secretary Poggio Bracciolini, it circulated widely in Italy. This is one of numerous copies made at that time. The coat of arms of Sixtus IV appears on this page. Pope Nicholas V became dissatisfied with Trebizond's work and commissioned a second translation by a rival Greek scholar, Theodore of Gaza. 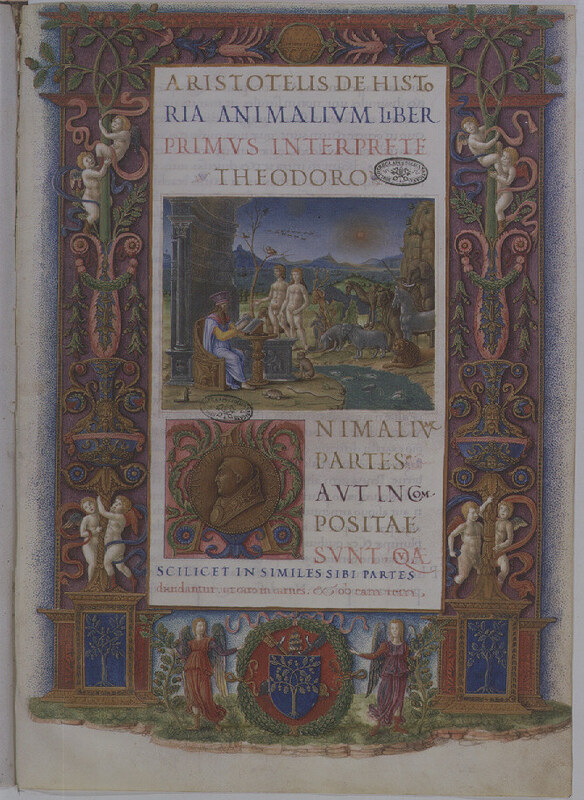 This manuscript is a revised version of Theodore's translation dedicated to Sixtus IV. The richly decorated title page centers on an imaginative depiction of Aristotle at work surrounded by animals and a naked human couple- -perhaps Adam and Eve. The medallion below portrays Sixtus IV and is inscribed "sacricultor" (keeper of sacred things); the medal above shows the Ponte Sisto and alludes to Sixtus's building program and role as ruler of the city of Rome. The writing is ascribed to Bartolomeo San Vito. You can see a small passage to the next room of the exhibit. No guards around, so you can 'touch' everything (if you do so, you will get a free poster of the picture you touched). Do you want to continue to the next room or turn around and go back to the Main Hall?